Bullying still exists until today. 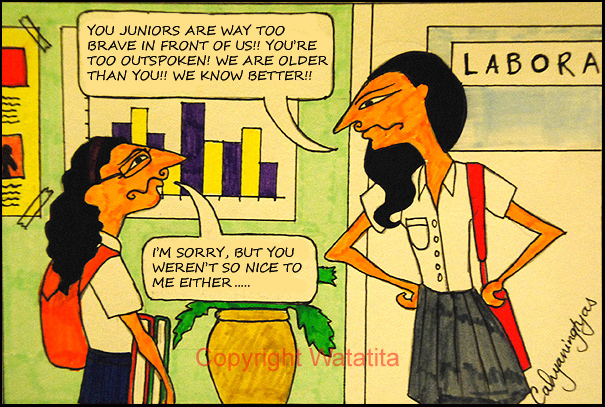 Seniority happens everywhere.. in the schools, offices, the Army,… everywhere. Tradition teaches us that we have to respect those who are older than us. Unfortunately, there are many people out there who misuse their seniority. Some feel that they are more important than others, some feel like they’re always right, there are also others who feels like they’re the best, and nobody can go against them. But this sort of mentality is the type of mentality I do not want to support. It is true that we have to respect people who are older than us, but older people, or the seniors, have to learn how to earn our respect! Don’t just boss around and bully other people. Seniority starts at school. The seniors feel like they own the school, and if there are juniors who appear to be a threat to them, or break their “rules”, they start bullying the juniors to spread fear, and so that the juniors would do as they say – even though the juniors have done nothing wrong. Sometimes the seniors just want to show their power, flex their muscles. When I was at school, I was one of the brave kind of juniors, I liked to stand up for myself, and many of my seniors disliked me for it. I was brought up in a family who taught me to stand up for myself (if I know that I am right). I remember being bullied once, and I was brave enough to talk back. When I went home, my mother rewarded me with a big bucket of chocolate ice cream. I didn’t care if many of my seniors didn’t like me. I was at school, so I’d rather focus on my studies, and that year when I got bullied, I was at the top of my class. Bullying didn’t affect me at all because it wasn’t the severe type of bullying. However, it does affect many people. It triggers suicide, depression, and many personality disorders. So, if you are a senior student, and someone from a junior class annoys you, please tell them nicely. Be a good example to the younger kids. That way, they would respect you, not hate you. If the juniors are being rude and offensive, it’s not a case you can handle yourself. Please tell a teacher or your principal, they will work it out. Bullying creates social inequality, rather than harmony. Just because you are older, it doesn’t mean that you are always right, and that you know best. Let’s stop bullying! Please read Sharing a Love of Teaching, a blog by Michael G. for more information and articles on bullying.